Incubus love a challenge. That’s what makes good music. Incubus also love to doing things a little differently and their latest album ‘If Not Now, When?’ is certainly that. Known for their tireless touring and broad musicality, they have been around since the early nineties and are still going very, very strong. Their six year hiatus from music (after the sixth studio album ‘Light Grenades’ was released in 2005) was like a holiday for Incubus, and now after a strong desire to get back to work, they have produced their “best record” in all its emotive and thought-provoking glory and want you to hear it. Lead vocalist Brandon Boyd tells us about the essential challenges that come with making music. The time the band members took away from music gave them chance to explore other fields of creativity such as art, literature and film, as well as the chance to “plant some roots” with ideas that would influence the recording of this album. After being in the cycle of releasing an album, going on tour, going back in the studio, releasing an album and hitting the road since they were young men of nineteen, it was time for Incubus to figure themselves out as individuals. Brandon says, “We have had to be obsessed with music, and our band in order to do the things that we do. Then we came to this weird crossroads in our mid-thirties having accomplished more than we ever thought we would. People usually de-rail, and the only option for them becomes drug addiction, an overdose or divorce, and that old story,” he continues. “I really don’t think we’re interested in those things, so in an attempt to start crafting a new story, we went off in search of ourselves in that period of time.”Having (presumably) found themselves now, all of the band members were keen to get back in the studio to create music together again, and so “this record is born purely of a desire and readiness to make an album and I think that the topic matter on the album speaks for itself”. Reluctant to give away anything more to those who haven’t already heard it (shame on the readers who have listened to the leak, but we can’t blame your curiosity), Brandon avoids any specifics about themes or sounds. Instead he tells us about the process of making a record: “We’re trying to live a creative life. We’ve never written a ‘concept album’, and I have never gone into a record thinking that I know I’m going to write about a, b or c,” he reflects, “I read, I listen, I observe, absorb and then I write. Michael [Einziger, lead guitar] does the same thing as far as his musical input and output is concerned. He and I then meet in the middle and we craft these things and then share them with the rest of our band. Having performed one UK date in London so far this year, Brandon apologetically promises more in other areas around the country, on behalf of his band: “We’re hoping to do a proper tour of the UK sometime in the fall. There are no hard dates penned in yet though,” he concludes. “We’re planning on being on the road for the next 14-to-18 months or so, but we will absolutely be doing a proper UK tour. We really like playing shows in the UK.” We will hold you to that, then Brandon! 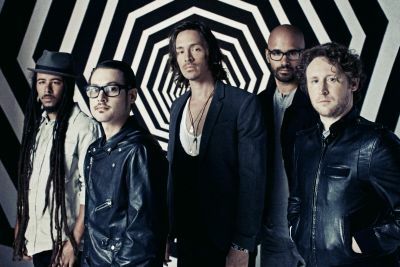 Incubus’ ‘If Not Now, When?’ is released on July 12, 2011 via Epic Records.